I recently received a message from reader, Yuvitra Jeyaraman, which said, "I stumbled across your blog as I was hunting for Lat books. I noticed that you have several Lat books and would like to know if you are interested in selling them?" Lat cartoons typically reflect a local way of life! I replied asking for more information because I wanted to know more about this reader who claims to be obsessed with Lat cartoons! Then I learnt she was 17 when her parents sent her to Canada to further her studies and now she’s an under-graduate at the University of Toronto, majoring in Political Science and History. When she left Malaysia, Yuvitra foolishly believed that her new home was Canada. On hindsight, she realised that it was anything but. In fact, she missed everything about Malaysia, even the things she didn’t think she would miss. One day, quite by accident, she picked up a Lat book and as she turned its pages, she discovered a sense of renewed pride in her identity as a Malaysian. Suddenly the terrible things like the infamous Malaysian traffic and political culture, didn’t seem so terrible. She told me how she enjoyed the way Lat comics reflected the little nuances that shape our Malaysian culture: Our willingness to go above and beyond for a complete stranger, the simultaneous obsession with politics and hope, and an unwavering faith in racial harmony. In short, the Lat books meant the world to her. Yuvitra was back in Kuala Lumpur for her summer break before she returns to Toronto for her second year of university. Then she asked me to tell her how and when I started reading Lat comics. My love affair with Lat started in the 1970s when Lat cartoons were published regularly in the New Straits Times. Even then, I could relate to the nostalgia and humour that Lat captured so vividly in his crazy illustrations and colourful characters. We were living in the government quarters while our parents were working with the Government Health Cub-centre in Masai. It was common then to keep newspapers clips and when my dad started us on collecting Lat cartoons, it was a regular ritual to cut out the cartoon strip and paste it in a large F4 size hardcover scrap book. In our family, it was often a race to be the first to read the Lat cartoon and tell the others about it. Sometimes when I turned the newspaper pages for the Lat cartoon, I was greeted by a gaping hole because someone had already cut it out! A picture truly tells a thousand words and Lat used his drawings to tell his stories effectively with his brand of humour, even in historical events. His comics were also a source of cross-cultural education because I learnt a great deal about the Malay, Indian and Punjabi cultures here. Yuvitra’s message prompted me to take another look at our collection of yellowed newspaper clips and it was not long before I was laughing along with the wit of Datuk Mohammad Nor Khalid or Datuk Lat and his ability to make us laugh at ourselves and our Malaysian ways. In a collection themed, Scenes of Malaysian Life, Lat covered a wide range of topics and showed no mercy, poking fun at politicians, actors, sports personalities, city or kampung folks and even tourists and foreigners. No one was spared as Lat aptly portrayed them and their typical ways. I was fascinated by Lat’s astute take on ‘A Night Out in JB’ because the sites he highlighted in this comic strip back then, no longer exists now. In it, he clearly made a mockery of the romantic ambience of the Golden Mile, a former seafront promenade at the Johor Straits which was lit up by electric bulbs on tacky artificial trees. While fishing was popular at the Johor Straits at one time, the water has since turned toxic and any surviving sea creatures may not be the healthiest choice of a fresh catch now! In the final frame, Lat’s cool illustration of the first Chinese food court in JB, fondly called pasak-kia, depicted a group enjoying a hearty meal despite their proximity to the filth and stench from the open sewer, familiar to locals as the infamous Sungai Segget! JB checkpoint when visitors return from Singapore! In another comic strip which Lat entitled, ‘One afternoon in JB’ I realised that this practice is a thing of the past. Back then, locals would try to smuggle back items they shopped in Singapore. But now with their favourable exchange rate, the opposite is true because Singaporeans are shopping lavishly in JB and trying to smuggle back everything they bought cheaply! Lat’s collection of popular poses for photographs is so funny because it’s true! Just look into your family albums to find shots with similar poses, whether they are formal photos snapped in the photo studio or in the park! Lat cartoons are often presented in a single frame while his standard cartoon strip format are a series of small frames with the punch-line delivered in the final frame. With accuracy in his words and illustrations, it would take a few witty and well-chosen words inside a tiny dialogue bubble, to crack me up! A collection of popular poses for photographs! Nobody takes offence when his Chinese characters have awful buck teeth and slits for eyes while his Indian men usually sported thick waists or the extreme opposite, drawn with skinny (hairy!) legs and wearing a dhoti! I find it interesting that comic books, older than Yuvitra by several decades, made her reconnect with her country in the 21st century. It must be Lat’s unique brand of humour that binds us together. His wit and humour, artfully drawn into cartoons, are indeed an eye-opener for us to look for ways to unite ourselves with humility and mutual respect. Thanks Yuvitra, for reminding me that Lat cartoons are a viable record of our Malaysian heritage and a humorous complement to dry history books. On whether or not I would part with my Lat books – regretfully it’s not likely to happen. I’m early. So I find myself a seat in the Axis Lounge to wait for my tea-time friend to arrive. Little did I know, Gwen was already waiting for me in The Food Store! When I received the invitation from the DoubleTree by Hilton Johor Baru to experience the Tropical High-Tea Set for Two, Gwen came to mind. That was because Gwen and I so enjoyed the Chocolate High-Tea together back in January and it will be fun to share this with her too. I don’t feel the time ticking by because a friend who spotted me there, came over for a chat and when he left, I glance at my phone and read Gwen’s message, saying she is already here. Ah! It really looks like we are both ready for our high-tea. Once we are comfortably settled at our table, the wait-staff politely proffer a menu turned to the page that lists a selection of premium teas. Ooooh… what a choice of premium tea flavours! Spoilt for choice, we take a moment to consider which to have. Gwen picks a brew of Peppermint tea while I choose Ginger-Lemongrass. Our attention is then riveted to the three-tier stand on which the elegant Tropical High-Tea Set is presented. I spot the chefs responsible for this presentation, Chef Firdaus and Chef Zulhilmi, and approach them to ask how the tropical theme is met in the various cakes and pastries. This info will be helpful when I sample each item and to identify the taste of the various flavours. “Palm sugar and soursop in panna cotta,” said Chef Firdaus. Not only did my ears perk up but my imagination soared as my mouth watered to the idea of how the sweetness of palm sugar vividly contrasts with the tangy taste of soursop in smooth panna cotta. I raise my eyebrows when I hear him continue with, “Jackfruit Cheesecake,” because it’s good to hear that the humble local jackfruit has found its way into cheesecake! The King of Fruits, a popular ingredient in various desserts, also has its place in the Tropical High-Tea. Presented as Vanilla Durian Choux, they are a pair of tiny crème puffs filled with vanilla durian cream! I think it is better to have a taste of what the chefs are talking about so I re-join Gwen who’s patiently waiting for me to start enjoying our lovely afternoon tea. She decides to begin with the scones and picks the Coconut Scone made with – get this – coconut cream and desiccated coconut, and savour it generously spread with whipped cream and strawberry jam. I wait for her to enjoy each mouthful – without making any further conversation with me – and that’s probably how good it tastes! Such an eloquent word which Malaysians understand! While the original English scone has its merits, I must agree that a scone that tastes lemak promises a little exciting edge. Meanwhile I’m sinking my teeth into the sandwiches. I like how sour dough bread is topped with slices of beetroot and garnished with tiny cubes of feta cheese. As we are munching, my only wish is for a little more feta cheese in it! While the High-Tea is an elegant meal shared among gentle-women, I must confess that I feel far from gentle when I come face-to-face with the Grilled Chicken with Hibiscus Spread rolled in a tortilla. There must be some tortilla etiquette for the right way to eat it in a hotel dining room but in order to taste all the ingredients in a mouthful, I discreetly pick it up to take a hearty bite. It’s tasty grilled chicken all right and again, I wish there is a little more of the Hibiscus spread. Gwen and I agree that all the sandwiches are interesting and the mini ciabatta stuffed with smoked salmon and tomato marmalade, is rather agreeable. Finally, it’s time for the sweet stuff. The little crème puff, Vanilla Durian Choux, literally needs no introduction because I can smell its pungent pong from afar! The miniature of Jackfruit Cheesecake is, as its name describes, mini but I still try to eat it in dainty bites to savour its fruity flavour along with fresh crunchy cubes of fruit. I’ve inevitably saved the best for last – the Palm Sugar or Gula Melaka and soursop in panna cotta – served in a tiny tumbler. Using little teaspoons, Gwen and I take our time to dig deep into the panna cotta to spoon the mixture up for a contrasting yet pleasing tropical taste of palm sugar with soursop. From July to September, the Tropical High-Tea Set for Two is served daily at the Axis Lounge and The Food Store from 3pm to 6pm, at RM58 nett per set. For more promotion details, visit Facebook DoubleTreeJB. 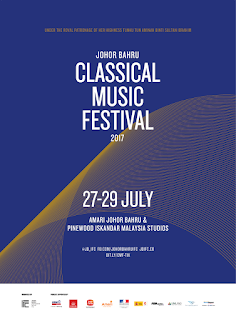 The third edition of the Johor Baru Classical Music Festival is happening from July 27 to 29, hosted at hotel Amari Johor Baru with the finale held at Pinewood Iskandar Malaysia Studios. The festival theme, “In Sync” explores the relevance of classical music today and how it acts a connecting bridge between diverse communities and generations. In line with its theme, the fest will showcase the synchronization of influences, styles and ideas to illustrate music at its most universal. Fans of classical music can look forward to four main concerts and six masterclasses and workshops conducted by top-class local and international orchestras and performers. 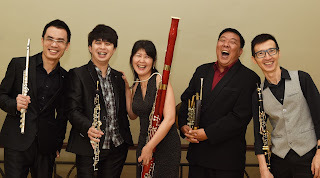 The concerts that will feature 123 performers, present unique perspective and flavour from Malaysia alongside international talents from Spain, France, Japan and Thailand. “This year’s festival aims to excite musical interest and emphasize the relevance of classical music – that it isn’t just for the learned or the generations before us but it is an avenue for storytelling for all,” said festival curator, Jonathan Oh. “The festival is also a precious learning and networking opportunity for aspiring musicians to exchange views with high-caliber musicians and develop a deeper passion and understanding of classical music and how relevant it is to the stories of our times,” he added. The programme is designed with something for everyone – aspiring musicians, music enthusiasts and those who are seeking something exciting and different to do during the weekend. The festival will start with Sans Frontieres, a multi-cultural collaboration of top-notch musicians from Spain, France and Japan featuring violinist Sayaka Ohira (Japan), Benjamin Fabre (France) on viola, pianist Mereia Frutos Fernandez (Spain) and cellist Ivan Torres (Spain). The title of this performance paints the transcendental nature of music into a picture of collaboration across time, culture and borders. 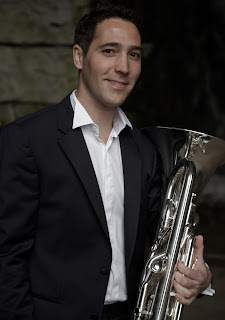 Jazz Up – Rhapsody in Blue will feature the National Symphony Orchestra Wind Ensemble teaming up with Misa Yamamoto and Julian Chan to explore the music of one of the most popular jazz composers of all-time, George Gershwin. Jazz fans can look forward to enjoying Gershwin classics as well as Scaramouche by Darius Milhaud and a beautiful French classic, Le Temps des Cerises (The Time of Cherries). Journey to the West Side will feature the Philharmonic Winds of Malaysia, an ensemble that will present an eclectically charming programme alongside Euphonium talent, Bastian Baumet. Go on an escapade in realizing the human condition through love and heartache from the youthful strides of Marquez Danzon to the ‘symphonic dances’ of two gangs in New York from Bernstein’s critically acclaimed, West Side Story. On the final night, Thailand’s acclaimed symphony orchestra, Siam Sinfonietta, will present A Thai Odyssey. Conducted by co-founder and Thai-American composer, Somtow Sucharitkul, this celebrated orchestra will present an explosive programme that includes love songs from the late Thai king Rama IX and Bela Bartok’s The Miraculous Mandarin. The conductor’s own composition, The Suriyothai Suite, will bring this year’s festival to an exciting close. Fans of the Star Wars saga cannot miss, The Empire Strikes a Chord: The Music of Star Wars through the Lens of Classical Music, one of the highlights of this year’s programme. Join musicologist Dr Andrew Filmer on a journey through sound and stars to explore the music of Star Wars. On Day 2 of the festival, masterclasses, special events and workshops are planned throughout the day. They include a Violin Masterclass with Sayaka Ohira and Benjamin Fabre, ABRSM and Trinity College London in Interview, The Piano Accompanist: Partner in Success or Failure and Violin Anatomy 101: Understanding String Instruments from the Inside Out. 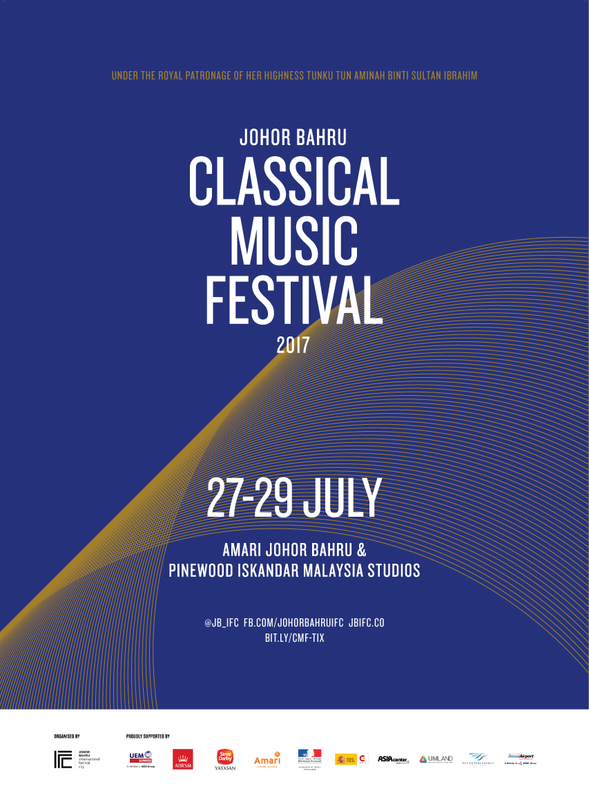 The JB Classical Musical Festival is presented by Johor Baru: International Festival City (JB:IFC) with more than 20 supporting partners under the royal patronage of Her Highness Tunku Tun Aminah binti Sultan Ibrahim. “6.30pm to 10.30pm starting in July for a limited time only,” I overheard this over bits of conversation during the evening cocktail to bid farewell to General Manager, Simon McGrath, and to welcome his replacement, Daniel Alcaraz. It was a casual get-together at the poolside and terrace outside Tosca, mainly of hoteliers and guests who were introduced to the hotel’s new GM. As the crowd thinned, I met Executive Chef Jaffery Othman, who filled me in on the current promotion of Grilled Tomahawk Steaks at Tosca and invited me over to dine. “So that was what they were talking about…” I thought to myself as I checked my calendar for a suitable date with Chef Jaffery. I know how chef enjoys cooking up something special for guests and I’ve often been the beneficiary of his culinary creations. Then we set a date. I remember how chef reminded me to come early and I reached Tosca Trattoria Italiana that evening in plenty of time to settle down with a drink. Then wreathed in smiles, Chef Jaffery introduced me to our dinner that night. It was a 1.5kg on-the-bone Rib Steak with the entire rib bone, French trimmed for the chunk to resemble a traditional North American tomahawk axe! “Grass-fed Black Angus,” chef said as he whisked the tomahawk steak into the kitchen to grill. That was a lot of meat on a long bone. As I was mulling over how we were going to do justice to that generous portion of meat, my dining partner showed up! He was none other than the GM himself, Daniel Alcaraz. After a long and eventful workday, Daniel was ready for a fortifying meal and we started with the appetizers. I reminded myself about how chef delights himself with feeding me so I paced myself carefully as I helped myself to the antipasto set out on the buffet. The grilled pumpkin and eggplant among the Tuscan-style grilled vegetables were my all-time favourites but I limited myself to just one piece each. A pinch each of the Classic Niciose Salad, Lamb Salad and Beetroot Salad made up a fair portion while I steered clear of the assorted toasted bruschetta because that would just fill me up. So when a freshly-made Italian clam soup was served, Daniel and I agreed that it came with the right kick. The tangy taste of fresh tomatoes combined with the savoury flavour of clams… hmm… I shamelessly used my fingers to remove the clam shells from my bowl and Daniel swiftly passed me a saucer for them. Then our main course was ready. Chef Jaffery proudly presented the platter of skillfully Grilled Tomahawk that was “well-rested” before it was served. What a gorgeous chunk! Chef allowed me to snap my fill of photos before he removed it back to the kitchen to carve and served it again, this time for us to eat. I recalled how chef pointed out the marbling on the tomahawk steak in its pre-cooked state and I was ready to taste the juicy, tender meat that was full of flavour. The Grilled Tomahawk was sliced and presented with vegetables like roasted garlic in oil, sun-dried tomatoes, roasted new potatoes and carrots. Two types of gravy were served on the side – black pepper and mushroom – but the meat was so tasty that I didn’t have to add any sauce. Chef joined us at the table for a bite and for a while there was silence as everyone savoured the steak. While chewing my juicy steak, I overheard someone speaking again. From the corner of my eye, I spied the wait staff explaining to diners about Tosca’s current promotion, priced from RM399 nett, the Grilled Tomahawk comfortably serves two to three people. Yes, I agreed that fans of good steak would certainly do justice to this portion of meat. Then Chef told us that the promotion was clearly gaining popularity as that evening itself, he cooked several orders– including ours – and one was for a room service order! In the tradition of Chef Jaffery who enjoys feeding me, he also served up a freshly-made pizza topped with smoked salmon and sour cream – to strike a balance with the meat in our meal. I quietly congratulated myself for pacing myself throughout the meal because the chef disappeared into the kitchen again only to emerge with a platter of delightful desserts. Since the GM was dining with us, chef took the opportunity to showcase some new varieties of cakes before they were served in the hotel restaurants. There was a delicate cheesecake, slices of opera cake and layered yam-cheese cake as well as a smooth panna cotta – all of which tasted just right with a cup of hot decaf coffee. DoubleTree by Hilton JB is at No. 12 Jalan Ngee Heng, 80000 Johor Baru. For reservations at Tosca Trattoria Italiana, Tel: 607 – 268 6868. The above messages and variations of such messages have been pouring in since the invitations were safely delivered by Abang Pos to invitees both here and Kuala Lumpur. Some added comments and questions about the invitation card like, “I like your invitation card. Did you design it?” I have replied with details about the design concept. Another who received the card after the Reply By date, asked “Is it too late to confirm attendance? And if not, is it ok to bring my husband along?” I promptly replied, assuring her that she should bring her husband. One of the guests boldly asked if she may bring four more people from their team! She said, “All of them want to go. Standing room is fine for them…” I couldn’t help smiling because it was heart-warming to know that they were so keen to be part of the event. It will certainly be a challenge to accommodate all my friends, relatives, business associates and contacts in one room so very regretfully, some may inevitably be left out. This however does not stop them from showing their support and interest in my book. When she added, “Must take photo of myself buying the book!” I reminded her that the store’s CCTV may catch her in action so it would be better if she asked the store assistant to snap the photo of her! I was not only amused but also deeply touched by her idea and gently reminded her that the books are not yet on the shelves until after its launch. Another former classmate who now resides in KL told me she shared The birth of my book on her Facebook page as well as with other Johor-related groups. One of her colleagues is also a Convent JB alumni (very much our junior!) and she too had shared the link with her friends. My initial plan for the book launch was a small but significant event but this idea seemed to have gone out the window. As I receive more replies confirming attendance, it really looks like there will only be standing room. The venue may not be big but I’m sure we will accommodate everyone quite comfortably. Words cannot fully describe how deeply I appreciate this awesome show of support from friends and family. Thank you all, so very much. P.S. I just received an email from MPH Publishing KL, informing that the books are ready and the batch for me, will be sent by courier today. [I’m speechless with excitement!] This means the books should be in the stores very soon. Graced by Tunku Panglima Johor, Tunku Abdul Rahman Ibni Sultan Ibrahim, who represented the club’s patron, Sultan Ibrahim Ibni Almarhum Sultan Iskandar, the installation of Datuk Teo Shiok Fu as the 66th President of the Rotary Club of Johor Baru (RCJB) on July 1, was a special event held on a significant date read as 1.7.17, the start of the Rotary year for 2017 – 2018 worldwide. Chartered in 1952, the RCJB is the oldest and largest club in the District, with 64 club members. It is a non-profit volunteer service organisation which runs social and community projects, primarily funded by public donations. In a simple ceremony, the immediate past president, Lee Soo Tong, handed over the club’s presidential jewel to Teo to install him as the club president for 2017 to 2018. In his presidential message, Teo said that while the club will continue with its two signature community projects – the Rotary Haemodialysis Centre and the Palliative Care Association of Johor Baru – this year it will also carry out various community projects for the needy and underprivileged with a focus on children’s welfare and education. Teo, a businessman, said that the club aims to create awareness of the social issues in our community through these meaningful projects and encourage others to help by participating with them. He outlined the club’s community projects that will start this July with the installation of a water filter pump system at a Tamil school in Kelapa Sawit. The school, which has 160 students, will benefit with clean drinking water and will also receive whiteboards for their classrooms. To celebrate National Day this August, the club will invite some 30 children with their care-givers from two orphanages to enjoy an outing to Legoland Malaysia Resort. The children, aged between six and 14, will have a theme-park experience with lunch in a half-day outing. “The youth is our future and it is important to guide them well,” said Teo as the club sponsors Interact Clubs in six secondary schools in JB. He said a career fair is being planned later this year to provide career guidance to students. The club also aims to organise an environment protection project with the community in the latter part of the Rotary year in 2018. This year, the club will mark its 10th annual visit to the Sobbhana Women’s Foundation in Phnom Penh, Cambodia. From Nov 23 to 25, the club will conduct a Dental Camp with the Cambodian Dental Association to provide free dental checks and treatments for up to 200 children who have no access to dental treatment and are often not aware of proper dental care. Finally, Teo announced that a charity walkathon is being planned for Sept 30, starting from Dataran Bandaraya Johor Baru, to raise RM500,000 in support of the club’s two signature projects. For more than 25 years, the Rotary Haemodialysis Centre has been providing highly subsidized treatments for needy patients here. Its current premises at a 4-storey building at Jalan Tun Abdul Razak, continues to meet patients’ increasing need of affordable dialysis treatments. The team at the Palliative Care Association of Johor Baru is providing medical support to terminally ill patients and their families through regular home visits. In addition to practical and medical advice, it also provides the loan of homecare equipment Free-of-Charge to needy patients. To kick off the fund-raising for these meaningful projects, OCBC Bank Malaysia donated the generous sum of RM50,000 as the main sponsor of the OCBC-RCJB Charity Walkathon. More information will be shared closer to the event date for the public to participate with the club in this worthwhile fund-raising effort. In closing, Teo reiterated that he and his club members, with their diverse vocations and skill sets, will work together in the club’s projects aimed at “Making a Difference” in our community.